Hello everyone, today I am sharing my February LO for the Dusty Attic blog how utterly brilliant are these word chippies To me Tranquility represents me in my garden In my garden I am in touch with nature and my soul I feel connected with the beauty which surrounds me . I seek it out , see the detail , the simplicity , I sense the power . I sense what I cant see and I sense what I cant feel . Nature truly lights up dark corners in my world . Mother nature is pure magic. My trade mark - creating layers of elements reminding me of mother nature. if we look deeply we can see detail after detail . I do find nature inspires me and helps me create my layouts . the chippies are treated with inks and paints . I just keep layering until I am happy with the result . bye for now and have fun with the chippies . they are available to purchase straight from the website . So gorgeous! LOVING the photo and the flower!!!!! Your layout's softely and beautiful. I like it. There's a nice harmony with picture. Your lay-out looks so serene, balanced and elegant! I just love it a lot! Heather, this is incredibly gorgeous! Tranquility is definitely emanating from this design. I LOVE it! Love & adore. That flower really is the perfect poser!!! And the layers are scrumptious! I'm glad you find solace in your garden.....I must admit, scrapping is my therapeutic place! I can lose myself in there & it feels good!!!! Utterly divine! Ahhh...I could look at this all day long. Gorgeous project! Love all about it! Such a perfect title Heather! The love of your garden just shines through in your divine layout - so uniquely you. The love you have for nature is truly reflected in your art. Your garden is simply beautiful and you've captured its tranquility in this layout. Just wonderful. This is dreamy, peaceful and oh so beautiful! Love the layers and all the embellies around your photo! Magnificent layout! wow, this is so beautiful again, dear Heather! Your layouts are always very beautiful and full of little and hidden details. 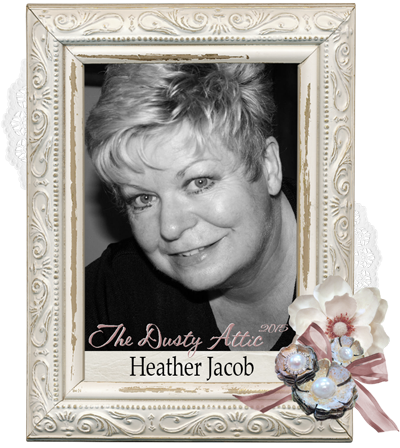 It's a pleasure looking at your creations over and over again Heather! Yes we can't take our eyes off your beautiful layouts! It's a "zen" image I could stand for hours admiring it! Love the soft colour palette, so pretty!